Creating a sitemap is no magic potion to increase search engine rankings. The ugly truth is that search engines won't even know about your sitemap until you tell them. Fortunately, you have tools on your side. XML Sitemaps comes with the search engine sub-module, and each search engine has sets of tools on their site to help you manage your site. Before you submit a sitemap to a search engine, you must verify that you are the owner of the site and are therefore allowed to provide a sitemap for it. Each search engine has a slightly different method of verification, but they are all roughly the same. In the following exercise, you verify your site with Google in order to submit a sitemap, which you'll do in the exercise directly following this one. In this exercise, you verify ownership of your site within Google Webmaster Tools. 1. Enable the Site Verification module that was installed in the previous exercise. 2. Get your site verification code from Google. 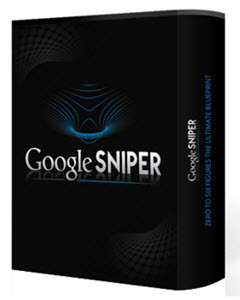 Start by navigating to http://google.com/webmasters and sign in with your Google account. If you don't have a Google account, you'll need to create one. 3. On your Google's account Home page, click Add a Site and type in your site's URL as shown in Figure 19-4. Click Continue. Messages [ Dont forward messages t) You have no unread messages. 4. On the next page (Verify Ownership), select Upload an HTML File and download the HTML verification file, as shown in Figure 19-5. Do not click Verify. 5. In a new browser tab or window, navigate to your Drupal site, and then navigate to Configuration C> Site Verification. 6. On the Site Verifications page, click the Add Verification tab and select Google as the search engine, as shown in Figure 19-6. Click Next. 7. 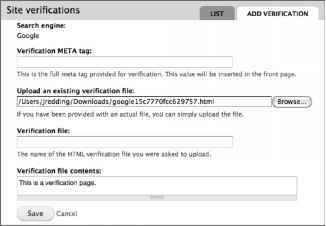 Upload the verification HTML file you downloaded from Google, as shown in Figure 19-7. Click Save. 4. Click the verily button below. 8. Return to Google's Verify Ownership page (step 4) and click Verify. 9. Still within Google Webmaster Tools, click the Return To Home link to return your account overview. Your site should be listed as either a Pending or Verified. You have no unread messages. Google and other search engines must verify that you are the site owner before they use your sitemap for indexing purposes. The common methods are uploading an HTML file to your site or adding a meta tag to your site's pages. The Site Verification module makes this process easy and is the preferred method for site verification. Google and other search engines will periodically recheck for site ownership, so do not delete your site verification settings. After your site is verified, you can add a sitemap to your Google Webmaster Tools account. Follow the next exercise to add your sitemap. 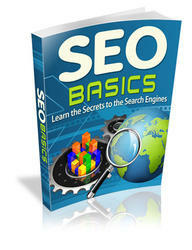 In this exercise, you submit the sitemap created in the previous exercise to the Google search engine. 1. Log into your Google Webmasters Tools account (if you are not still logged in), and click your site's URL on the account homepage (shown previously in Figure 19-8). 2. On the site's page, expand Site Configuration in the left sidebar, click Sitemaps, and then click Submit a Sitemap, as shown in Figure 19-9. Enter the URL of your sitemap, as noted in this chapter's first exercise. Submit a Sitemap to tell Google about pages on your site we might not otherwise discover. Adding your sitemap to your Google Webmaster Tools account begins the search crawling process. It may take Google between one minute and one month to fully crawl your site. After you have added your site to Google it's a good idea to add your site to other search engines as well. After you have verified your site and added your sitemap, your next step is to make sure that the search engine is kept up-to-date. Instead of waiting for search engines to come to your site, you can automatically ping them to inform of site updates. XML Sitemap includes the Search Engines submodule, which is used for this exact purpose. Enable it, and then navigate to Configuration C> XML Sitemap, click Search Engines, and select which search engines you want to be automatically informed (pinged) of your site's updates.